Cambodian Prime Minister Hun Sen speaks to reporters during a joint press briefing with his Vietnamese counterpart Nguyen Xuan Phuc in Hanoi, Vietnam, Dec. 7, 2018. Cambodia’s Parliament passed legislation Thursday that could allow a five-year ban on political activity by some top opposition politicians to be lifted. The action was the latest in a low-key charm offensive to improve relations with Western nations that accuse Prime Minister Hun Sen’s government of suppressing human and democratic rights. The U.S. and Germany have instituted some diplomatic sanctions against Cambodia, and Washington and the European Union have threatened to extend economic ones as well. The main point of contention has been this past July’s general election, which critics charge was neither free nor fair because the only credible opposition party had been dissolved and its candidates barred from politics. The late-2017 dissolution of the opposition Cambodia National Rescue Party by court order was generally seen as a move to ensure an election victory by Hun Sen’s ruling Cambodian People’s Party. The legislature’s action would allow the 118 top members of the Cambodia National Rescue Party to apply to have their bans lifted. However, there would be conditions for restoring political rights that some opposition politicians have already rejected. Hun Sen, at a meeting Wednesday with garment workers, said the ban would be rescinded only for those politicians who had honored it, while those who violated it could face a prison term. Chan Chen, center, lawyer to Kem Sokha, former leader of now dissolved opposition Cambodia National Rescue Party, talks with the media in front of his home in Phnom Penh, Sept. 10, 2018. Since the election, Hun Sen’s government has made a series of gestures in an effort to burnish its reputation. These include the freeing, either on bail or as a result of pardons, of political prisoners, including the head of the opposition Cambodia National Rescue Party, Kem Sokha, who was charged last year with treason on the basis of scant evidence. He is now being held under house arrest. Many of the banned opposition politicians fled Cambodia in fear of arrest, and restoration of their political rights alone would appear to leave them in the political wilderness. There are no guarantees that new legal actions would not be taken against them in the courts, which are generally seen as being under the government’s influence. 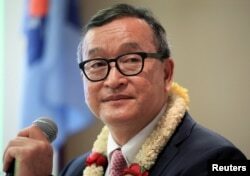 FILE - Cambodian opposition leader Sam Rainsy delivers a speech to members of the Cambodia National Rescue Party (CNRP) at a hotel in metro Manila, Philippines, June 29, 2016. However, feuding between factions of the opposition party loyal to its two former presidents, Kem Sokha and Sam Rainsy, jeopardize a united front against the government’s invitation to rejoin the political scene.